You’ve been working hard. You’re thinking about your radio station all the time. You’re at dinner with friends, and you’re silently chewing on ideas for some new clocks. Instead of singing in the shower, you’re thinking about getting your imaging and music to sing together. At the movies, you’re not paying attention to the plot, instead you’re thinking about the pay raise you’ll get when your improved ratings come out after you implement all the changes you have in mind. But there’s a problem. How do you get all those changes in place without screwing up what’s already on the air? The solution is to clone your database. This way you can make all those changes you’re thinking about, try them out off the air, and when you have it just right, switch to the clone! When it’s all done, you have an exact duplicate of your database. That means the export design is still there, and your definition files will still work. Your library and clocks are all the same. Your layouts are just as you’re accustomed. Even your username and password are the same. You’ve cloned your database and want to get busy working on a bunch of new clocks. The structure of the clocks will remain, but with new element types and some cool new features. Is there a way to clone all my active clocks? Go to Dataset/Clocks/Assignment Grids. Highlight the grid you wish to clone then click the Copy button. Now you’ll be able to give this new grid a unique description as well as make copies of all the clocks. You can also tell MusicMaster with what character you want those clock copies to begin. Click OK and you’ll have an exact copy of each clock from the original grid, now assigned to that cloned grid. To edit the clocks, open the new assignment grid, then double-click on the clocks within to make your changes. Don’t forget to save the changes after you’ve completed your new clocks! Have you ever thought about making some wild changes to your database but you are afraid to because if it does not work the way you want it to you’ll have no way back? I’ve been there too! It reminds me of my early days in the business when I would edit a spot or song on reel-to-reel. Every cut and splice meant there was no going back; total commitment! Sometimes it worked out sometimes it didn’t. Then came computers and non-destructive audio editing where you could have as many copies of a track as you wanted and all of them are in pristine, original quality. Make a mistake, try again no problem. There is a similarity here with your MusicMaster database. Let me explain. Let’s say I am running a Classic Hits station and have always had my categories as A-60’s, B-70’s, C-80’s etc. to keep things simple but I am considering completely overhauling my categories to be more like A-60’s British, A2-60’s Psychedelic, A3-60’s Pop, B-70’s Love Songs, B2-70’s American Rock, etc. These are some pretty big changes and if I make those changes and it proves to be a train wreck I have a lot of work to do to get things right again. MusicMaster has you covered. 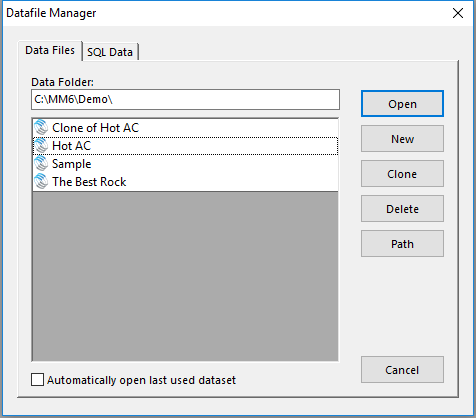 Just open your Datafile Manager and select the database you want to clone then click the “Clone” button. 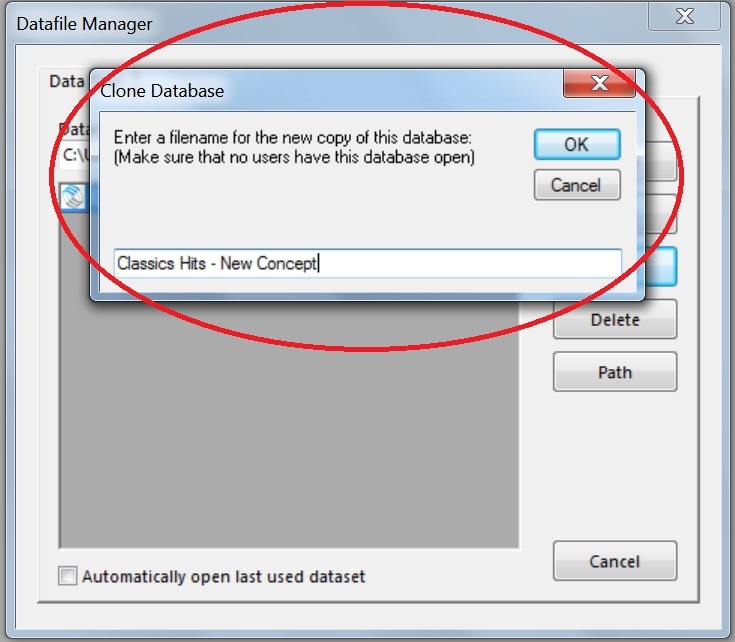 Once you do this another window will pop up with a box that allows you to name this new version(Clone) of your database something that will differentiate it from the original. 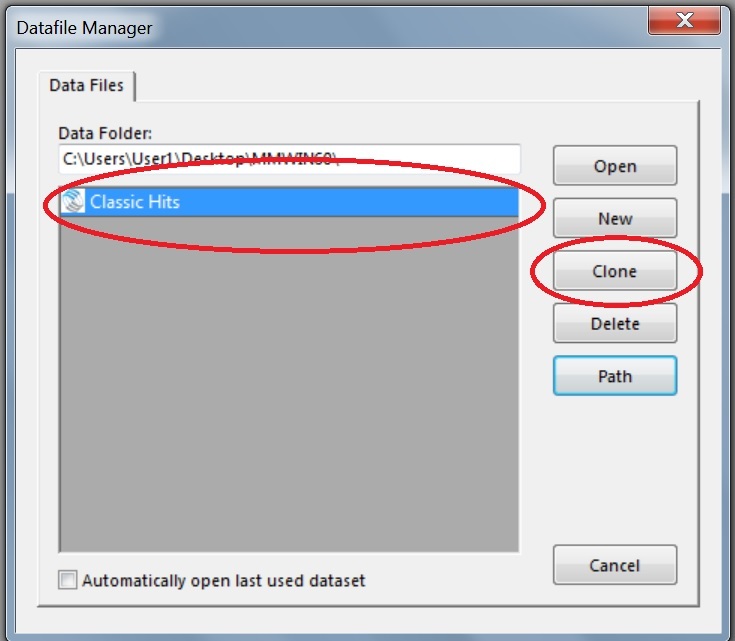 In my example I am calling the clone “Classic Hits – New Concept” so I know this is the one I can fool around in. This clone is an exact copy of the original database and includes your Export Design and all of your current settings, clocks, grids etc. You can make all of the changes you have been dreaming about and it will not affect your original database at all. Change your categories. Shake up your Rules or start all over with new rules. Create new clocks to reflect your vision using your new categories and Auto-Schedule to see if it works the way you want it to. All the while, you can continue to use your original dataset to schedule on the air. Since this a clone, you might schedule out six weeks and then review history graphs to confirm the change is what you want. Once you are satisfied, you’ll have two choices: If you’ve done this testing quickly enough, you could simply begin exporting from this clone. If there is a gap in the logs scheduled, you could reconcile the aired logs into the cloned data and proceed or you could make the changes in your on-air data knowing the changes have been tested and will do what you want. Cloning is a great way to try out new things in your database in a non-destructive way, completely shaking things up while preserving what you know already works. As always, remember to make backups of your data before making any big changes. This too gives you a way back. Have fun! If you’re using MusicMaster Version 5.0 or later, you have the ability to clone portions of a scheduled log into another part of the day or other days entirely. 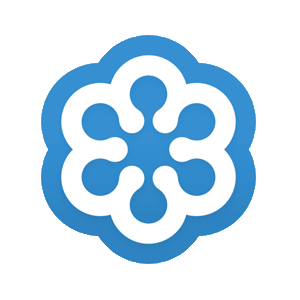 This allows you very easily to reuse already scheduled content with very little effort, perhaps a countdown show, or a special feature or hours that might be time consuming to recreate “by hand”.